While beloved by tourists, Times Square is easily the most hated destination for those who actually live in New York City. And it’s no wonder: Shoulder to shoulder traffic, blinding lights, costumed (and un-costumed) characters, honking cars, and not a tree in sight—Times Square is pretty much your worst nightmare come to life. But could this congested consumerist hellscape one day become a place “Real New Yorkers” want to visit? 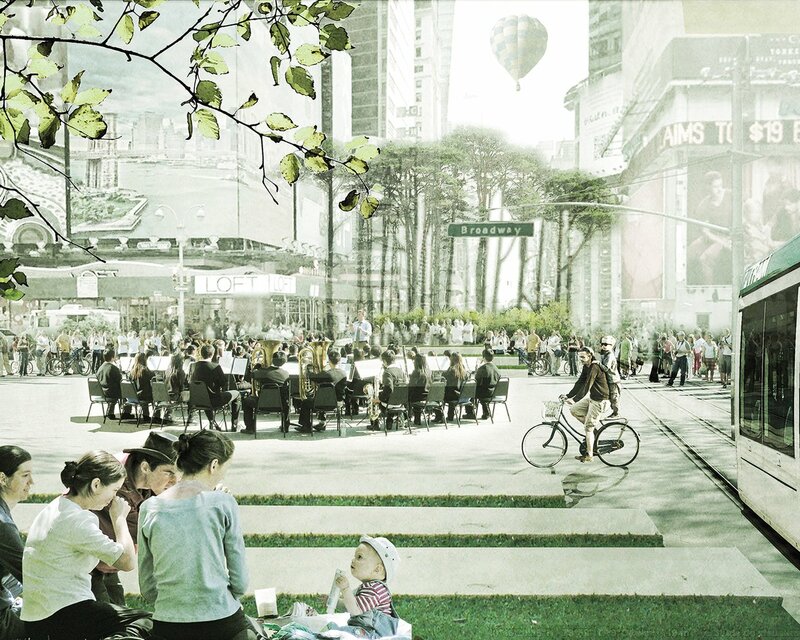 Last year, the Institute for Rational Urban Mobility and vision42 held a competition asking designers and architects to rethink 42nd Street—from the East River to the Hudson River—as a “pedestrian-friendly, auto-free, sustainable boulevard.” 200 submissions were received, and the institute has just announced the four finalists. 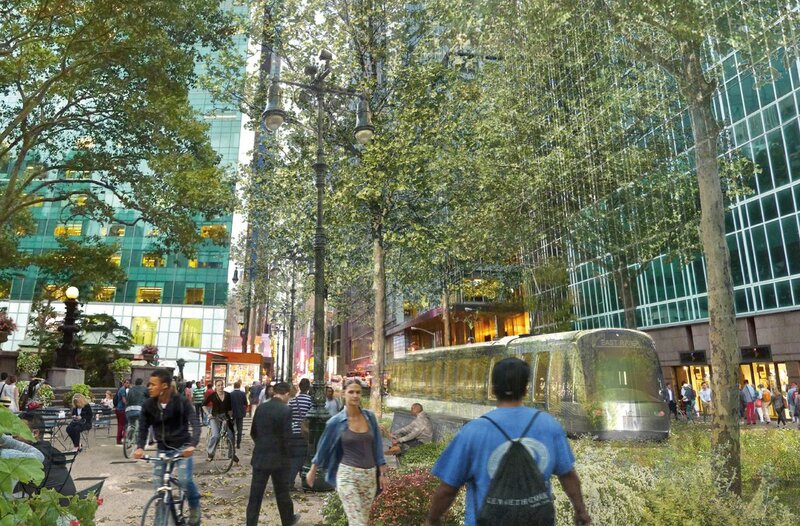 Above, light rail designers Alfred Peter, Charles Bové and Karen (Bloch) Listowsky of ateliergeorges studio turn 42nd Street into a verdant thoroughfare supported by surface transportation that includes a tram and a moving sidewalk—both carrying passengers crosstown from river to river. As the design stretches across the island, the aesthetic changes to mirror the neighborhood’s style. Mathieu Delorme, a France-based urban planner, proposes moving the heart of 42nd Street to a more diplomatic urban square in front of the UN building on the East Side. 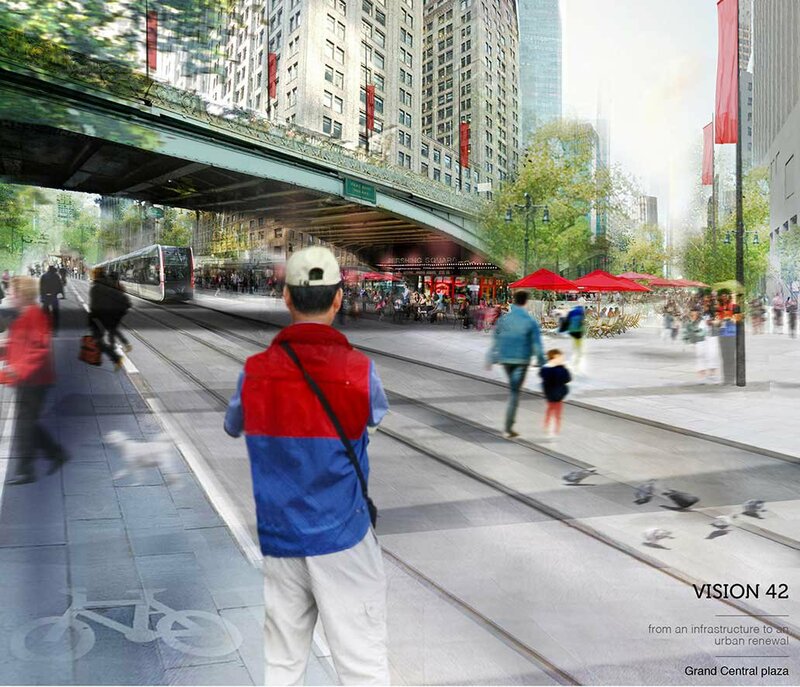 His proposal would also connect light rail transportation to the rest of the city’s mass transit, and reserve space for markets, street food festivals and other open air activities. 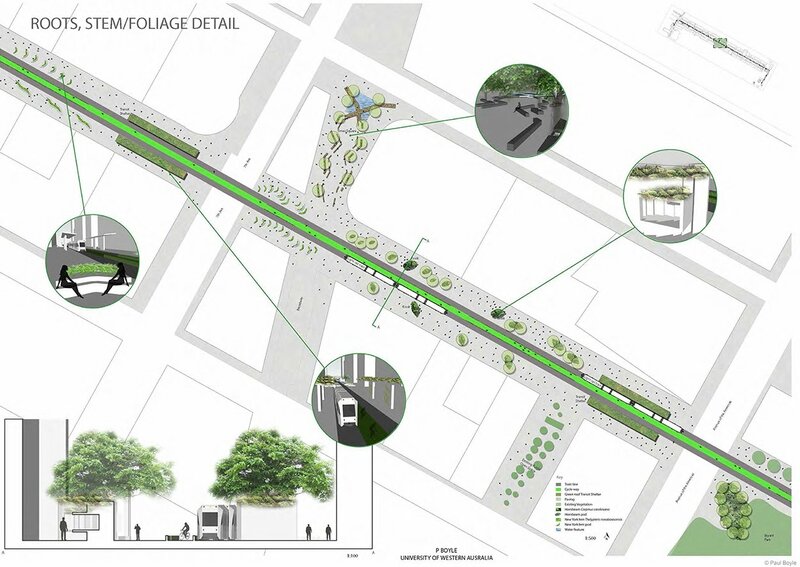 Delorme’s vision also sees the addition of more public green space through the revitalization of riverfronts, which too would be served well by light rail. Tiago Torres Campos’s idea is to turn 42nd Street into defined areas so that the street becomes a “gathering place, an urban and cultural stage and an environmental facilitator.” He’s created what he calls “units” called Times Square Meadows, the East 42nd Waveland Park, and the East River Wetlands. Each would reconnect the population with the ecology, geology, and geography that existed before development. His proposal also includes replacing West Side parking lots with two self-sustaining sky-scraper-sized greenhouses. Architecture student Paul Boyle proposes a light rail system coupled with a greenway growing out of 42nd street at its heart. The greenway would include native plantings that would signal light rail stations, resting spaces, playgrounds, bike and pedestrian lanes, and strategically-placed tree plantings cool the area. Though these visions seem far too ambitious to ever be initiated, we wouldn’t put them on the back burner just yet. According to Fast Company, Vision42 has already completed a number of technical studies showing the benefits of the idea. Moreover, an idea to rid 42nd Street of cars dates back as far as four decades ago, and it would have come to fruition in the early ’90s if the necessary funding was available. And if you remember, Times Square, along Broadway from 42nd Street to 47th Street, used to be open to cars. An effort by then-Mayor Bloomberg to make the area safer saw the streets transformed into strictly pedestrian plazas in 2010. There is also of course the controversial rezoning of East Midtown and the construction of One Vanderbilt, which will without question change the face of an area that also touches 42nd Street.